District Judge Landya B. McCafferty of the U.S. District Court for New Hampshire has scheduled the first bellwether trial in the MDL involving Atrium's C-Qur hernia mesh product. Judge McCafferty set the first trial to begin around February 2020. The C-Qur lawsuits involve allegations that the surgical mesh implant has caused pain and even death in patients. The first lawsuits against Atrium were filed around August 2016. Hundreds more soon followed and the C-Qur cases in Federal Court were soon consolidated into an MDL in the U.S. District Court for New Hampshire around December of that year. Judge McCafferty was assigned to oversee the C-Qur MDL. How much do we expect the average hernia mesh settlement will be? Let's dig into the numbers and come up with some idea of the value of these claims might be. A hernia involves abdominal tissue and organs that protrude through a tear in the abdominal muscle wall. Surgical repair of the abdominal muscle wall involves the implanting of artificial mesh or patch devices to provide support for tissue to re-grow around. Surgical mesh devices must be harmless to living tissue and benign inside the body in order to prevent the body's immune system from rejecting it. Mesh devices are divided into absorbable and permanent mesh devices. Absorbable devices are made of animal tissue and absorb into the body once implanted. They are not meant to be permanent and become less sturdy long-term. Absorbable devices only provide temporary reinforcement. Once the absorbable mesh degrades, new tissue growth is meant to take its place. Non-absorbable mesh implants are made from non-toxic plastic materials coated with a biocompatible substance. Unlike absorbable mesh implants, non-absorbable ones are meant to be permanent. Atrium's C-Qur is a non-absorbable hernia mesh made out of polypropylene. It is coated with layer of Omega-3 fatty acid, which is made of fish oil. The coating is meant to prevent tissue from attaching to the mesh. Doctors can also trim the C-Qur mesh before implanting to customize it to a particular patient. The C-Qur Hernia mesh was cleared by the FDA around March 2016. Atrium utilized the FDA's 510(k) clearance program, which allows companies to bypass normal research and study requirements on the product if it is similar to existing ones already on the market. C-Qur qualified for this fast-track approval proves because it was comparable to similar hernia mesh products that were approved in the 1990s. However, Omega-3 fatty acid coating made the C-Qur mesh distinct from all other hernia mesh products and it was this coating that ultimately became the source of later problems. Despite the FDA's clearance of the C-Qur mesh, the product has resulted in numerous health complications in certain patients who had the mesh surgically implanted in their body. What happened? The device makers sold the material in the C-Qur as inert. Now, there is a substantial body of scientific evidence support suggesting that this mesh material is biologically incompatible as used does not work as it should. This material seems to promote an immune response in a large subset of the patients using C-Cur. This immune response further promotes the degradation of the polypropylene mesh and the patient's surrounding tissue. The result can be severe adverse reactions to the mesh. Plaintiffs' attorneys claim in numerous lawsuits that the result is severe inflammation, gastric ulcers, and organ perforation. The C-Qur mesh product also became stuck to the bowel and other organs in some patients requiring extensive surgical repair. The source of these problems with C-Qur was the unique omega-3 coating around the plastic mesh. Unfortunately the omega-3 fatty acid coating was defective and demonstrated a tendency to degrade very quickly and separate from the plastic mesh once implanted. Without the coating the plastic mesh became non-compatible inside the body resulting the host of health complications described above. In certain patients degradation of the coating triggered severe allergic reactions that were sometimes life threatening. 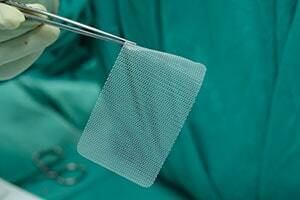 The FDA started taking action about the problems with the C-Qur hernia mesh several years ago. In October 2012, an initial warning letter was issued by the FDA to Atrium. It noted that Atrium did not properly sterilize C-Qur products, which could result in infections in those who have the implant. The FDA warning also noted that human hair had been found in the mesh coating in several instances. The FDA suggested that the problems with the C-Qur coating may be related to temperature change during the manufacturing process causing deterioration of the coating on the plastic mesh. In the summer of 2013 the FDA issued a Class II recall on thousands of Atrium's C-Qur mesh devices that were defectively manufactured causing the coating to stick to the packaging when exposed to high humidity for a lengthy period of time. Atrium responded to the recall by warning providers on the risks of storing the hernia mesh in high-humidity areas. Finally in February 2015, the U.S. Department of Justice, on behalf of the FDA, filed a lawsuit against Atrium in the District Court of New Hampshire. The suit alleged that Atrium knowingly introduced an inferior medical device into the market. Days later, a permanent injunction was issued by the FDA, which temporarily stopped the distribution and manufacture of the C-Qur hernia mesh at the Atrium facility in Hudson, New Hampshire. Importantly, plaintiffs' lawsuits alleged that when concern was raised about problems with C-Cur, not only did the device maker keep this from the FDA but it also misled doctors about the fact that O3FA might cause allergic reactions in patients who receive the C-Qur Mesh. This is a serious claim and pre-trial discovery in these C-Qur lawsuits will flush out this issue. Following the FDA recall and injunction hundreds of C-Qur mesh lawsuits starting getting filed against Atrim across the country. The C-Qur lawsuits pending in federal courts were soon consolidated into a multidistrict litigation (MDL) around December 2016. The lawsuits allege that the C-Qur products were unsafe and were introduced to market without proper testing. The suits bring several types of product liability claims against Atrium including failure to warn, defective design, and defective manufacture. The first bellwether trial in the C-Qur MDL is set to begin around February 2020. Have You Been Injured by the C-Qur Hernia Mesh? If you have a C-Qur surgical mesh implant and you have been experiencing health complications you can start by reporting your case to the FDA. Reporting them may increase chances that the courts might hold Atrium liable for complications resulting from these C-Qur implants. You should also contact your physician or other medical provider. They will give you advice on how to proceed forward in dealing with complications you may have from C-Qur mesh implants. It is not too late to file your own suit against Atrium for injuries caused by the C-Qur surgical mesh implant. Our law firm is accepting new C-Qur cases. If you have a C-Qur mesh injury please call us at 800-553-8082 or get a free consultation online.